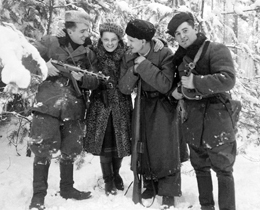 The Jewish Partisan Educational Foundation (JPEF) inspires and educates young people around the world through the history and life lessons of the Jewish partisans. Hundreds of thousands of educators, institutions, and private citizens worldwide use JPEF materials, reaching over a million students since 2000. Read on for information about JPEF's programs and materials. Developed by professional educators, JPEF's curriculum-based tools are designed to reach 7th-12th grade students in a variety of settings. 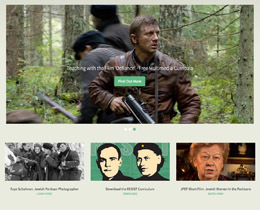 JPEF's printed materials, short films, videos, and interactive website can be integrated into World History, Ethics, Holocaust education, and English classes. Our materials also fit into units on wilderness survival for summer camp curricula, and can inspire teens to create positive change in their communities through service learning. All of JPEF's materials are available free of charge and soon will be divided into separate curricula, designed for the specific needs of a variety of educators. 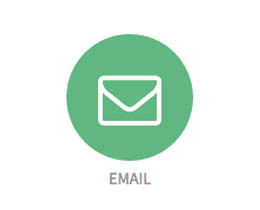 To view our current printed materials, visit the Curriculum section of our site. JPEF's website is unique to the Internet: bringing together short films, video clips, 3-D environments, curriculum, study guides, biographies, and interactive opportunities. 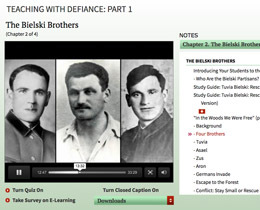 In addition to its role as the largest on-line resource for information about the Jewish partisans, the site uses new media to appeal to teens and educators, and can be accessed directly from the classroom. Future additions to the site will include an archive of partisan songs, interactive maps, diaries, and timelines, as well as materials specifically tailored toward diverse educators. All materials are free of charge. JPEF’s short films are 3-7 minutes in length, making them ideal for classroom and internet viewing. Composed of footage from JPEF’s original interviews, and from archival footage from Russian, Lithuania and Italy, these compelling films bring the experiences of the Jewish partisans to life. Most films are complemented by a printed study guide or activity developed by JPEF’s educators. Narrated by Ed Asner, Tovah Felshuh, Larry King and Liev Schrieber, the films can be seen here, or by ordering a DVD via email, dvd@jewishpartisans.org. 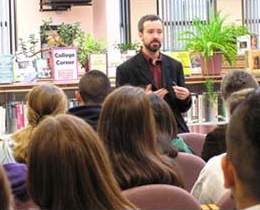 Jewish Partisan Educational Foundation Executive Director Mitch Braff gives a presentation to high schoolstudents in Livingston New Jersey. In addition to distributing our materials through these core channels, JPEF provides other services to the community including teacher trainings, a speakers' bureau and a variety of presentations. JPEF is continually looking for new partner organizations to bring the story of the partisans to life for teens around the country. JPEF's unique archive of over 50 interviews with Jewish partisans from all over the world lies at the heart of everything we do. Each JPEF interview is approximately three and one-half hours in length and deals exclusively with the Jewish partisan experience. 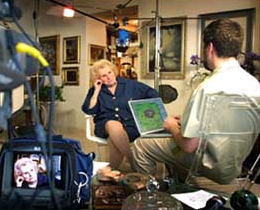 Other oral history projects have focused on the life stories of Holocaust survivors. By focusing solely on the partisan experience, JPEF provides a unique opportunity for an in-depth understanding of these powerful stories. 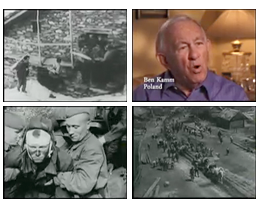 In addition to being an unprecedented source for understanding the Jewish partisan experience, the interviews are the foundational source for JPEF's educational curricula and other projects. Recurrent themes from the interviews are developed into categories for understanding the Jewish partisan experience. For example, students can learn about women in the partisans, antisemitism in the partisans, heroism in the partisans, or partisan involvement in the establishment of the State of Israel. To see a clip from an interview with a Jewish partisan, click here. 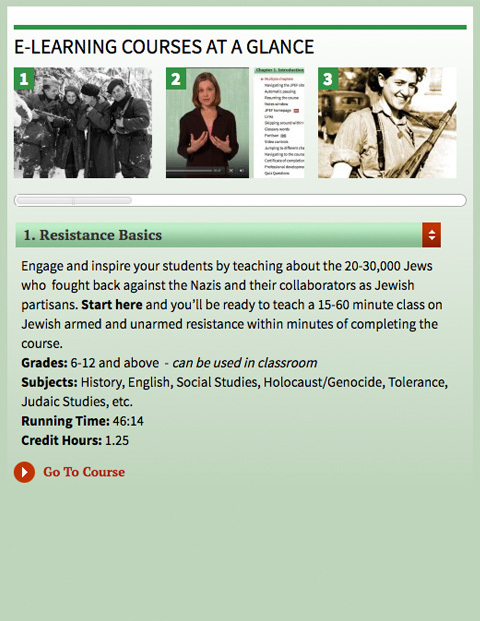 JPEF offers free online teacher training to help educators teach about the Jewish partisans and use our materials. Free Continuing Education Units (CEU's) for completing JPEF courses are available through Touro College. 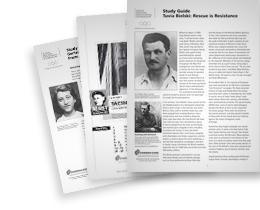 Video courses range from Resistance Basics, Women in the Partisans and Living & Surviving in the Partisans to Teaching with the Film 'Defiance' and Strengthening Jewish pride. 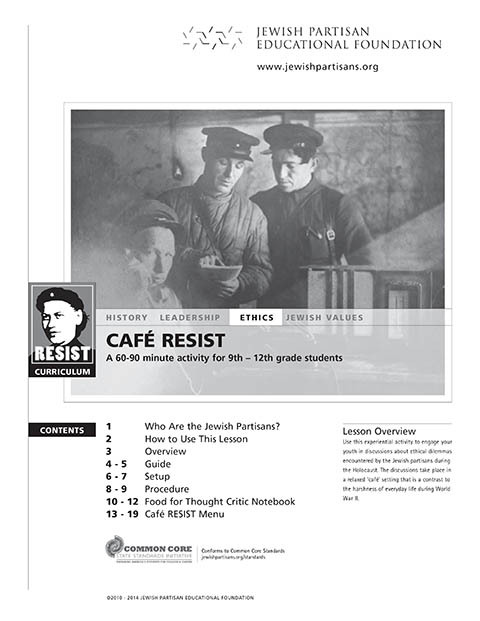 JPEF also offers a classroom version of our Resistance Basics introductory course, suitable for middle- and high-school students, as well as college level. Pictures of Resistance: The Wartime Photography of Jewish Partisan Faye Schulman, is a traveling exhibition of photographs by Faye Schulman, the only known Jewish partisan to document the World War II experience on film. Produced by the Jewish Partisan Educational Foundation (JPEF), and curated by Jill Vexler, Ph.D, the exhibit has been displayed in more than 30 cities in the United States, Canada, Israel, Poland, South Africa, and Switzerland.